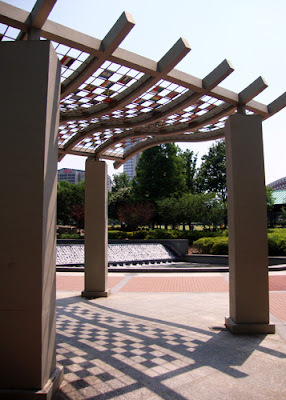 The Quilt of Nations in Centennial Olympic Park is one of my favorite structures in the 21-acre park, the largest downtown park developed in the United States in the last 25 years. In March 2011, I posted a photo of the "ceiling" of the Quilt of Nations. This particular image depicts more of the structure as seen when approaching it. Representing each of the 197 countries that participated in the 1996 Olympic Games, the most countries to ever participate in the Olympic Games, is a flag for each respective country. They're arranged alphabetically. The quilt and leaf pattern seen throughout the Park was adopted by the Olympic Committee as the "official look" of the 1996 Games because of its representation of the American South. 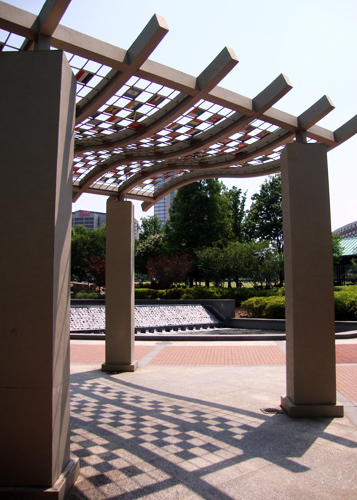 The Quilt of Nations is one of five quilt plazas in Centennial Olympic Park.